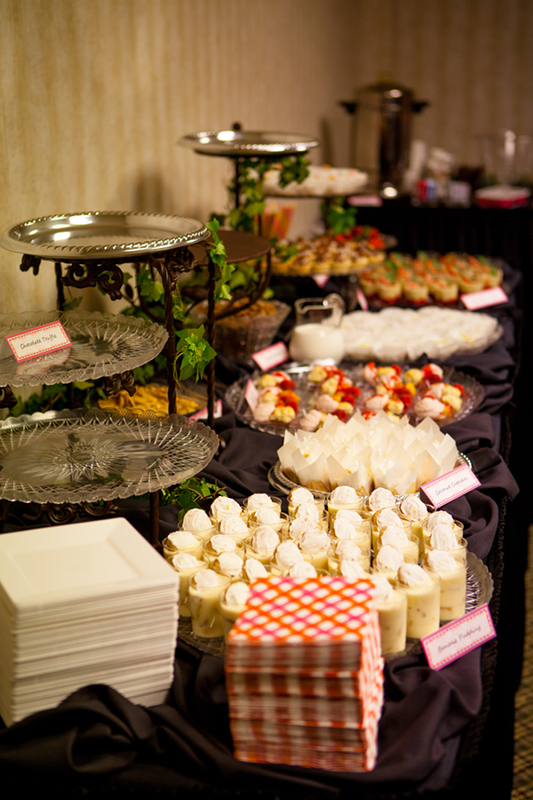 Several weeks ago I catered a wedding rehearsal event – Individual size Southern-style desserts for 85. I was quite busy with the preparation so these are all the photos I took. It was my first non-wedding cake event. 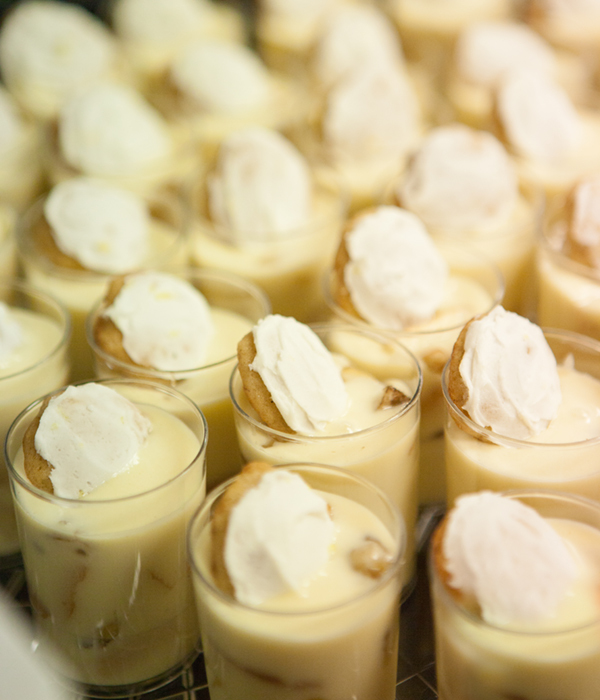 I will say, making individual size servings of seven different desserts for 85 people is much more complicated than making a wedding cake for 250! Whew! I was thrilled that it turned out so well. Three of my sons did a fantastic job helping the day of the event. So very thankful for their help. I prepared 24 separate recipes for all the components. 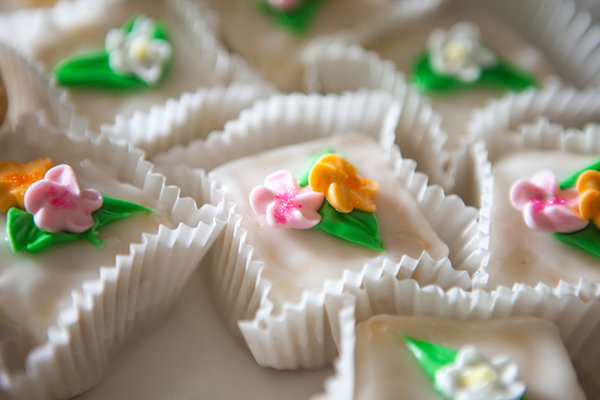 I didn’t have time to make the Silk Buttercream for the Pecan Tarts so I had to use a simple buttercream instead but everything else went according to plan. 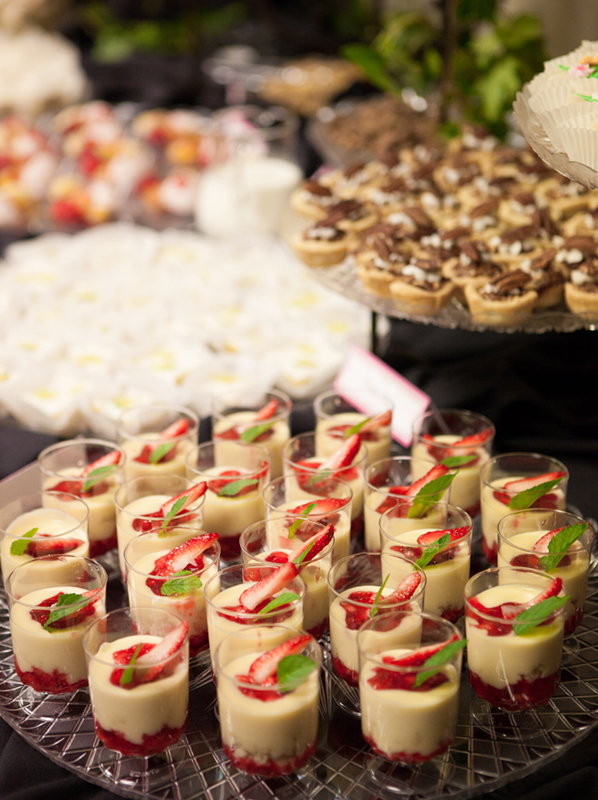 Not seen well in the photos: bowls of Peanut Brittle, Spiced Pecans, Fresh Strawberries. Also: Pink Lemonade, Strawberry and Orange stick candy. 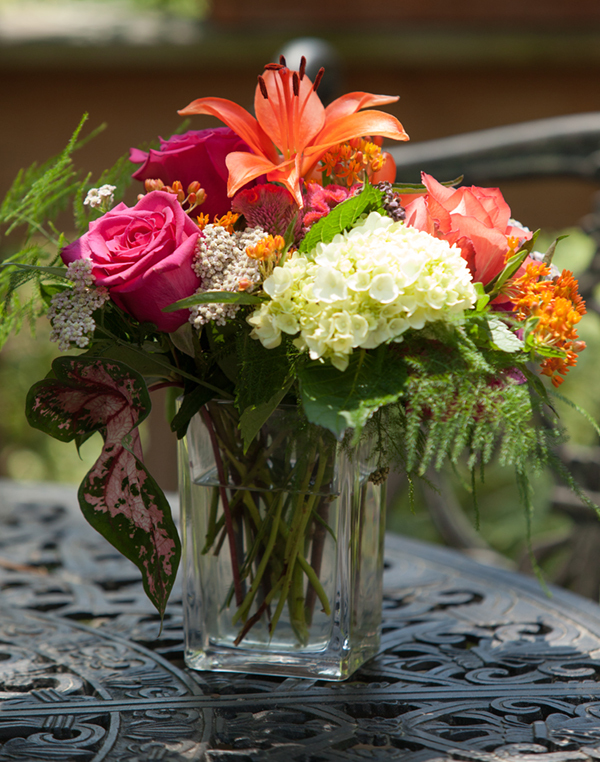 One of the beautiful bouquets from the buffet table, given to me by my dear friend after the event. I was not able to get a photo of the table with the bouquets but it looked lovely! 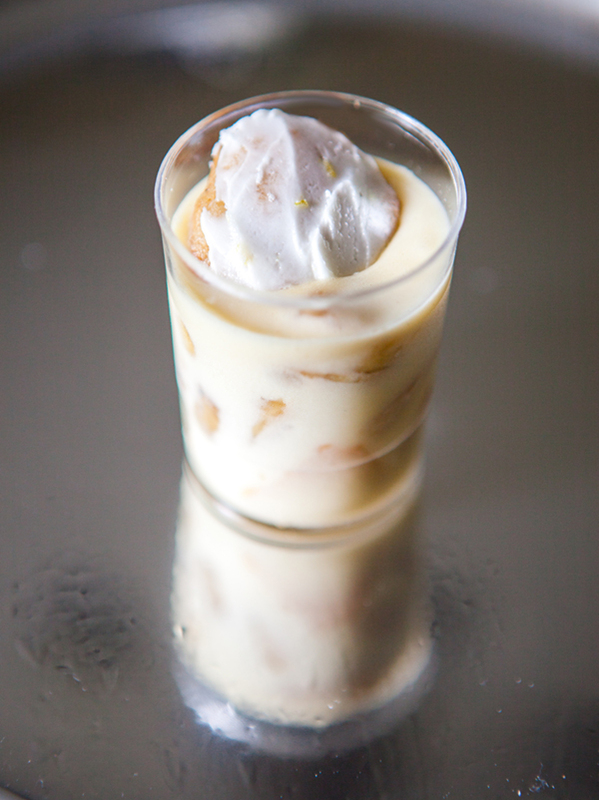 Banana Puddings, garnished with a mini Banana Spice Cookie with Lemon Frosting. 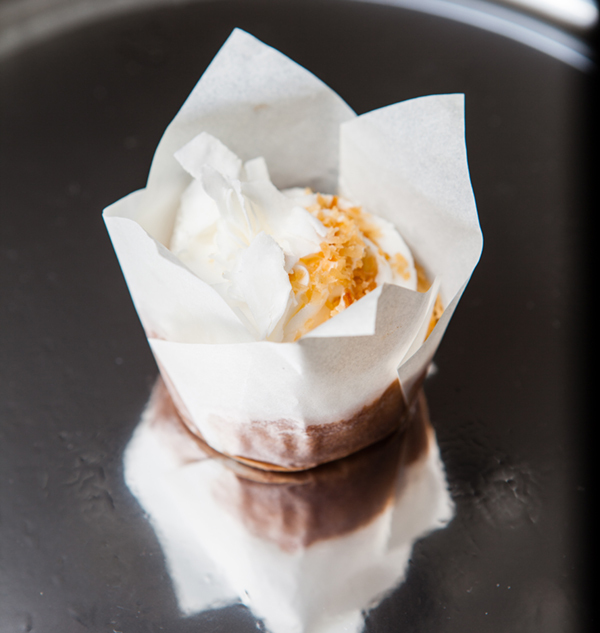 Half-size Toasted Coconut Cupcakes, garnished with unsweetened Toasted Coconut and large Coconut Flakes. 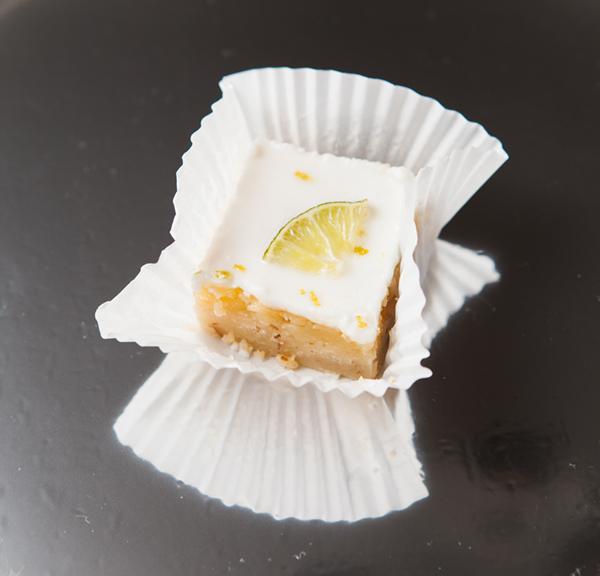 Key Lime Pie Bars, garnished with a thin slice of Key lime. 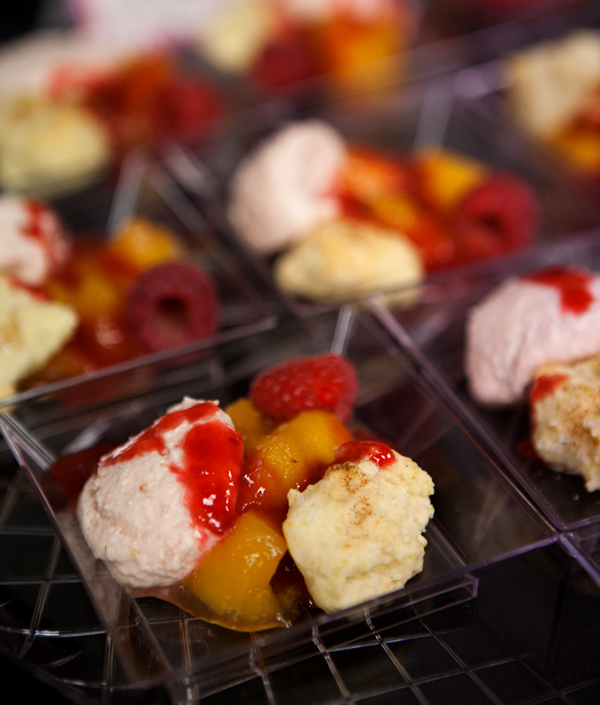 Peach Melba Shortcake, served with Fresh Raspberry Mousse, a Cinnamon Biscuit and Vanilla Bean Cream. 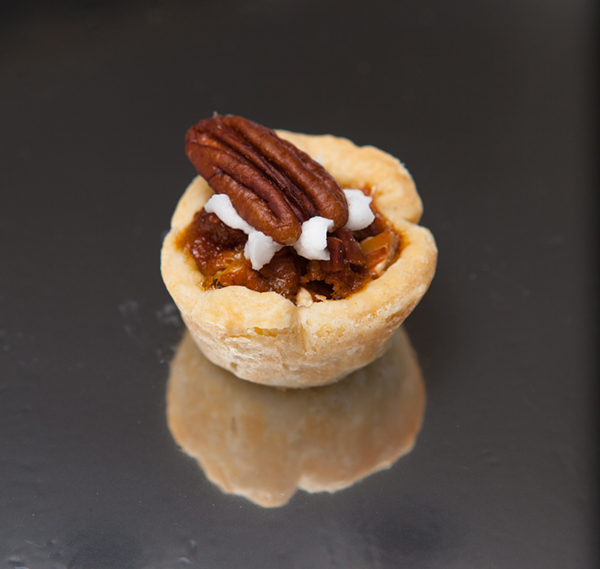 Pecan Tarts – one sweet bite of Pecan Pie. 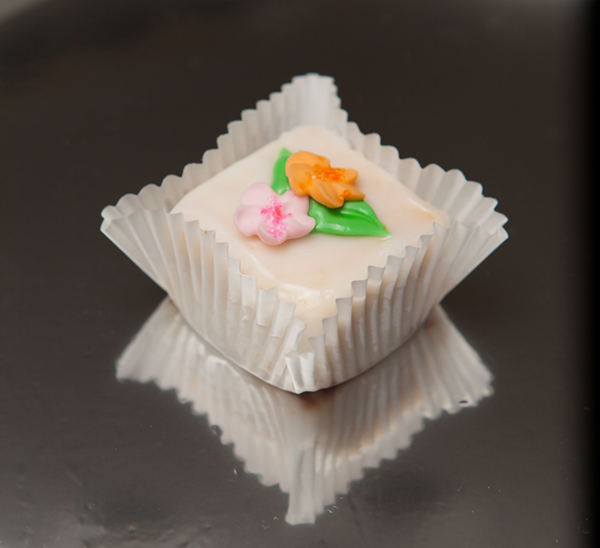 Petit Fours – Lemon Sponge Cake with raspberry jam and Almond Poured Fondant. 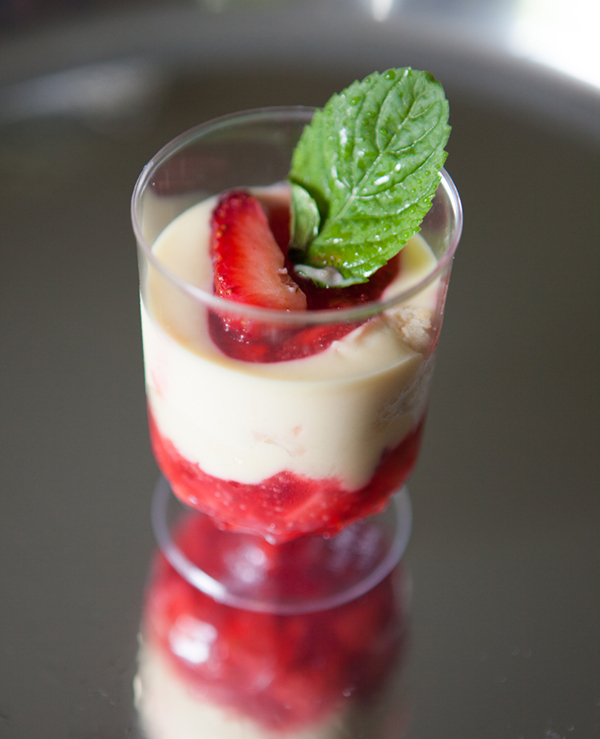 Strawberry Trifle – layers of sherry-soaked Vanilla Bean cake with Italian Custard and strawberries. Thank you! The pecan pies were a new recipe and I discovered a secret ingredient, Lyle’s Golden Syrup, that made them taste especially delicious. I had never used the syrup before and it’s now a staple in my cupboard. absolutely beautiful! You are so very talented. what a neat idea! And, you accomplished it beautifully! 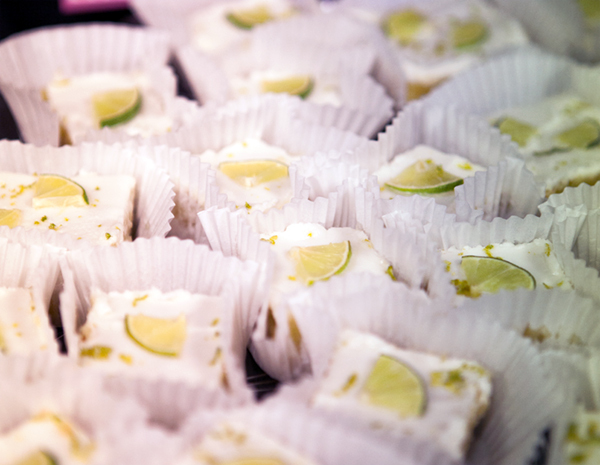 If they tasted half as good as they looked, and I’m sure that they did, wow! Wonderful! 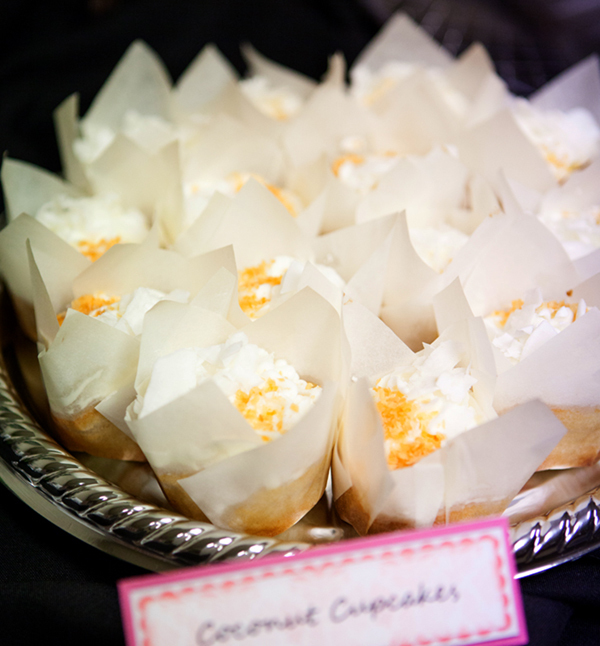 I may have seen those coconut cupcakes with the parchment cups – nice visual effect! Thank you, Sarah! I was really pleased with how my recipe turned out. The toasted coconut was delicious! Wow!! Beautiful and I’m sure DELICIOUS!!! So very proud of you Julie! !